China plans to build its first-ever floating nuclear power station in the Yellow Sea this year, and has announced plans to build about 20 more in the near future if the first one succeeds. This news has raised eyebrows in South Korea, located just across the Yellow Sea from China. China’s state-run broadcaster CCTV published a report on March 12 that China will begin construction this year on its first floating nuclear power station in the Yellow Sea off the coast of Yantai City, Shandong Province. The report quoted Luo Qi, director of the Nuclear Power Institute of China, the research and development arm of the state-owned China National Nuclear Corp., who said that the station will use ACP100S small nuclear power reactors, a system exclusively developed by the institute. The project will cost 14 billion yuan ($2.08 billion), and is set to be ready for operation in 2021. The state-run Global Times’ military magazine reported on May 3, 2018, that floating nuclear power stations also have military applications. 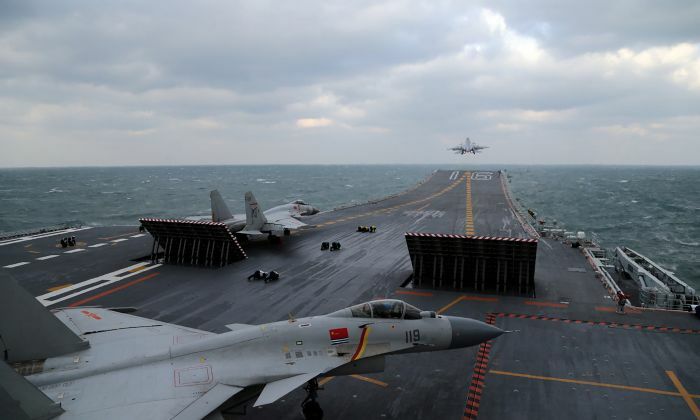 The report said the station can act as a “non-sinking nuclear aircraft carrier” for island bases, since its generated power can keep military equipment running for long periods of time. “A floating nuclear power station can guarantee that military equipment on an island, including radar, fighter jets, air defense missiles, and anti-ship missiles, work continually,” according to the report. Meanwhile, a January 2016 report by the state-run China Securities Journal noted that floating nuclear power stations can also meet the energy demands of offshore oil production at the Bohai Sea, a gulf located within the Yellow Sea. To provide power for such oil production, China’s state-owned shipbuilder plans to cooperate with the China National Nuclear Corporation to build 20 floating stations, the report noted. In a November 2018 report, state-run China Business Network quoted Ye Qizhen, a notable nuclear power expert, who said the ACP100S can generate electricity and perform seawater desalination, which can provide power and water to staff working on an offshore oil platform. A February 2016 blog post by the U.S.-based Singularity University explained that a tsunami or earthquake may cause a nuclear leak, leading to radiation pollution. The Chinese regime has embraced nuclear power in spite of some countries’ concerns about nuclear accidents. According to the China Nuclear Energy Association, the country currently has 44 operating nuclear power plant units on land, with plans to build about 100 more by the end of 2020. So far, Russia is the only country in the world that has a floating nuclear power station, named the Akademik Lomonosov. The station has two reactors, and is planned for formal operation this summer, according to Bellona, a Europe-based environmental nonprofit. Many Chinese media reports have criticized Washington following news that the Trump administration intends to end the Intermediate-Range Nuclear Forces (INF) Treaty signed during the Cold War.